The Pathfinder Society (PFS) Roleplaying Guild is a globe-spanning campaign played by gamers at conventions, game stores, retail locations, or at home. 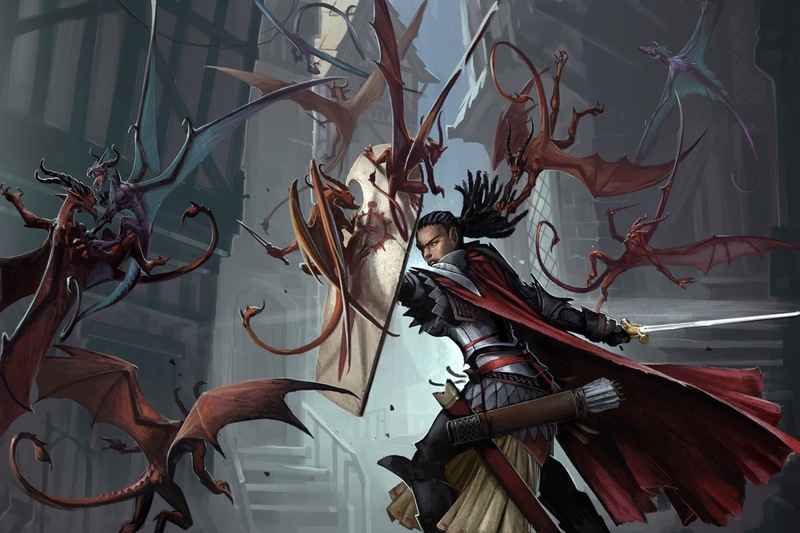 It presents a nice change of pace from more traditional campaigns, as it allows players much more flexibility when it comes to scheduling their next session. Following a standardized set of rules, players create a character, register online, and play in sanctioned scenarios, modules, and adventure paths. At the end of each session, the Game Master or coordinator will fill out "Chronicle Sheets" players use to improve their character and register the results of the game online. Afterward, players can find a new game to play whenever they are ready at any location to continue their adventures! There are two primary means to stay up-to-date with the current Pathfinder events in the San Francisco Bay Area- the mailing list and our Facebook page. Both of these are active and contain questions, answers, events, and ways you can get more involved too! Also, we have our Meetup group you can join to hear about the great events we help run. If you have any questions, or are unsure of anything listed on this site, please do reach out! The Pathfinder Society is an inclusive experience, and all should feel welcome at any event, particularly within the Bay Area. The established Community Standards Policy highlights a way for you to be heard regarding any questions or concerns you may have. To resolve any issues or questions you should first contact the event coordinator who will work to resolve the issue or escalate to the Venture Officers below. If you have a new location or an update to any information on this site, please send an email to the mailing list, a message on Facebook, or fix it up directly on the site's Github repository. The artwork displayed on our blog is courtesy of the new Curse of the Crimson Throne hardcover, featured on Paizo's blog. Pathfinder is a registered trademark of Paizo Publishing, LLC, and the Pathfinder Roleplaying Game and the Pathfinder Roleplaying Game Compatibility Logo are trademarks of Paizo Publishing, LLC, and are used under the Pathfinder Roleplaying Game Compatibility License. This website uses trademarks and/or copyrights owned by Paizo Publishing, LLC, which are used under Paizo's Community Use Policy. We are expressly prohibited from charging you to use or access this content. This website is not published, endorsed, or specifically approved by Paizo Publishing. Please visit the Paizo website for more information about Paizo's Community Use Policy.